AIR BRUSHING. A participant in a previous year’s GO Paint! 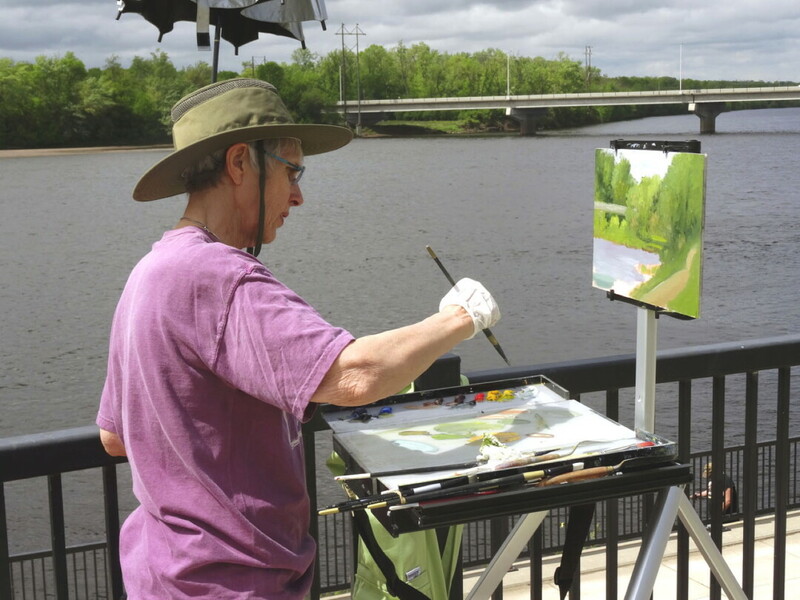 plein air event captured the scenery along the Chippewa River near Durand. This year’s event encompasses more of the Chippewa Valley. Whether you’re a novice, an expert, or want to try something new, the fifth annual GO Paint! plein air event inviting all art enthusiasts throughout the Chippewa Valley to participate. The kickoff is at 1pm Saturday, May 6, Phoenix Park, and events carry on through May 13. From competitions with cash prizes to simple submissions, it’s hard to find an excuse not to take part in this artistic happening! The GO Paint! event isn’t just for the artists, but the public as well. Grab a coffee downtown, walk along the main drag, and watch the artists at work. Dolan-Neill revealed, “The best way to view artists during this event will be on Saturday, May 6, from 3-5 pm. We will have our Quick Paint competition at this time and over 20 registered artists will be in Phoenix Park painting away.” May 6 isn’t the only day to witness art in the making. “Artists will be allowed to submit up to five paintings from the week-long event,” Dolan-Neill added. The sale of paintings created during the week will continue throughout the summer. Accola estimated that the final, juried exhibit and sale will feature more than 100 paintings. Dolan-Neill adds, “There is so much scope for the imagination in our area; beautiful rolling farmlands, dramatic river banks, charming downtown areas, prairies and forests – all within a 10-mile radius of the Eau Claire and Chippewa rivers.” Get out there and paint! To learn more or to purchase tickets for workshops, visit eauclairearts.com/gopaint.phtml or contact ECRAC at (715) 832-2787.